President Donald Trump, center, accompanied by from left, Senate Majority Leader Mitch McConnell of Kentucky, Vice President Mike Pence, House Majority Leader Kevin McCarthy of California, House Majority Whip Steve Scalise, R-La., and Secretary of State Rex Tillerson, speaks after participating in a Congressional Republican Leadership Retreat at Camp David, Md., Jan. 6, 2018. U.S. President Donald Trump on Saturday declared "everything I've done is 100 percent proper" amid increasing scrutiny about whether he sought to derail a federal investigation into possible collusion between his election campaign and Russia. "There's been no collusion, there's been no crime," said Trump, suggesting Hillary Clinton might be under investigation. "But I'm not," said Trump, referencing the former secretary of state and Democratic Party nominee he defeated to become president. Trump said if there had been any collusion with Moscow, it was by Clinton or the Democratic National Committee. The special counsel's investigation of the Trump campaign is "making our country look foolish," the president asserted. Trump spoke to reporters in a cold aircraft hangar at the Camp David presidential retreat, flanked by Republican congressional leaders, Vice President Mike Pence, Secretary of State Rex Tillerson and Secretary of Defense Jim Mattis. Trump answered several questions about his early Saturday morning tweets in which he declared himself a "very stable genius" and attacked the author of a book about the first year of his presidency. 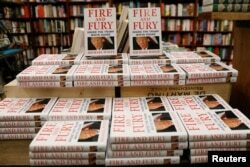 Copies of the book "Fire and Fury: Inside the Trump White House" by author Michael Wolff are seen at the Book Culture bookstore in New York, Jan. 5, 2018. Trump also continued to lash out at his former chief strategist, Steve Bannon, who is quoted extensively in the new book that raises questions about the president's fitness for office. "I consider it a work of fiction," Trump told reporters about Fire and Fury, which was released Friday and instantly became a best-seller. The president suggested that the author, Michael Wolff, was able to get such a book published only because "the libel laws are very weak in this country." Wolff's book portrays the first year of the Trump presidency as one in shambles, and the president as childlike and possibly in need of psychiatric help. Trump blames the news media and Democrats for reviving a strategy he said they used against former Republican President Ronald Reagan in the 1980s (who, his younger son Ron Reagan has suggested, suffered from Alzheimer's disease while still in office). The president then defended his mental and intellectual abilities, labeling himself a "genius" — unlike Hillary Clinton. Trump told the White House press pool that had been summoned to Camp David that he tweeted about his mental fitness "only because I went to the best colleges or college ... made billions and billions of dollars" and had "tremendous success." Trump's self-promotion of mental acuity is doing nothing to quell the debate about the president's stability. Richard Painter, an ethics lawyer for President George W. Bush a decade ago, called Trump's Saturday tweets an embarrassment, saying they read like "a statement by an immature candidate for second-grade class president." Painter, a prominent critic of the Trump presidency, tweeted, " 'I am a very stable genius' is the way people talk on the way to the funny farm, not the Situation Room. Or so it was a year ago." John Aravosis, a former Republican congressional foreign policy adviser who has become a Democratic political consultant, tweeted, "If you want to avoid a national discussion of your sanity, don't rave publicly about your sanity." In a Quinnipiac poll last month, 70 percent of respondents answered "no" when asked whether they considered Trump "level-headed." 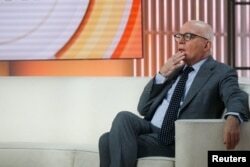 FILE - Author Michael Wolff is seen on the set of NBC's "Today" show prior to an interview about his book "Fire and Fury: Inside the Trump White House" in New York City, Jan. 5, 2018. Wolff said Friday that he stood by "absolutely everything" in the book. "One of the things we have to count on is that Donald Trump will attack. He will send lawyer's letters. This is a 35-year history of how he approaches everything," he told NBC's Today show. "My credibility is being questioned by a man who has less credibility than perhaps anyone who has ever walked on Earth at this point." "I will tell you the one description that everyone gave, everyone has in common: They all say he is like a child," Wolff added. "And what they mean by that is he has a need for immediate gratification. It is all about him." Trump denies granting Wolff any interviews in the White House and blames Bannon for allowing him wide West Wing access. "I guess sloppy Steve brought him into the White House quite a bit," Trump told reporters in the Camp David hangar. Trump's lawyers initially tried to block the book's publication, describing it as defamatory and libelous. Wolff is known for publishing provocative material, some of which has turned out to be unsubstantiated or disputed. Initial readers of Fire and Fury have spotted numerous factual errors in the book. Former White House press secretary Sean Spicer, who is quoted in the book, said Friday on ABC's Good Morning America that even if parts of the book are not accurate, the problem is "the reader is not left to know which is true and which is not." VOA's Peter Heinlein contributed to this report.